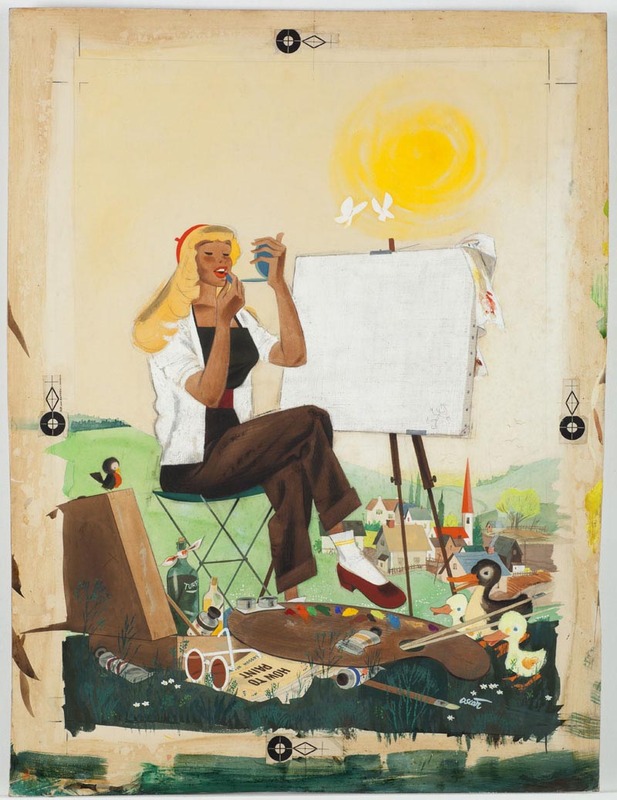 With his European training and creativity, Oscar Cahén was soon able to pick his work. For 70 years Canadians had been running to New York in search of better jobs. 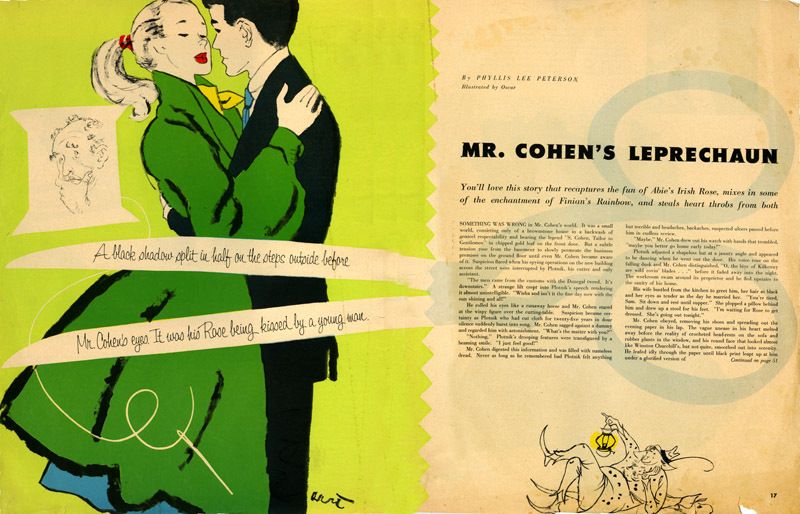 But when he was offered a high salary of $25,000 to join an ad agency (some sources say Esquire) in New York before 1951, Cahén opted to remain in Canada with an income of $15,000, perhaps in part because he was allowed much autonomy and a closer relationship with art directors than would have been possible in New York. 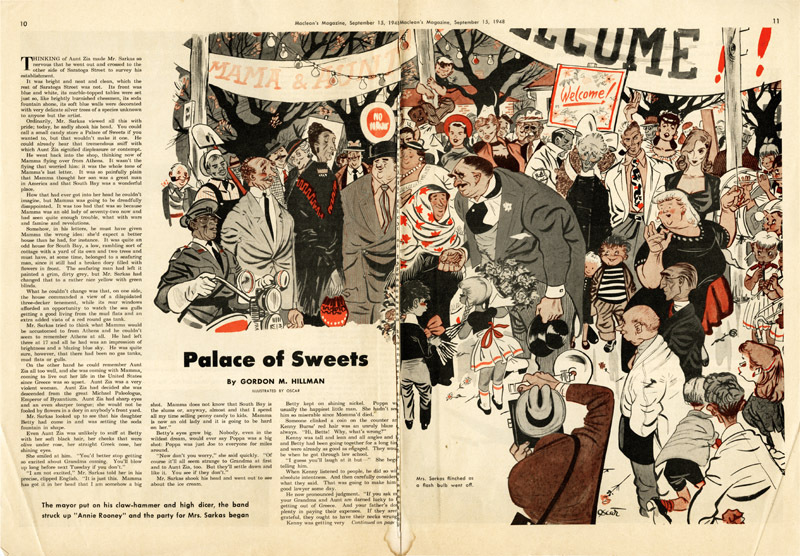 In the 1950s MacLean’s and other Canadian magazines ran many stories with diverse multicultural characters, more than comparable American periodicals of the day. 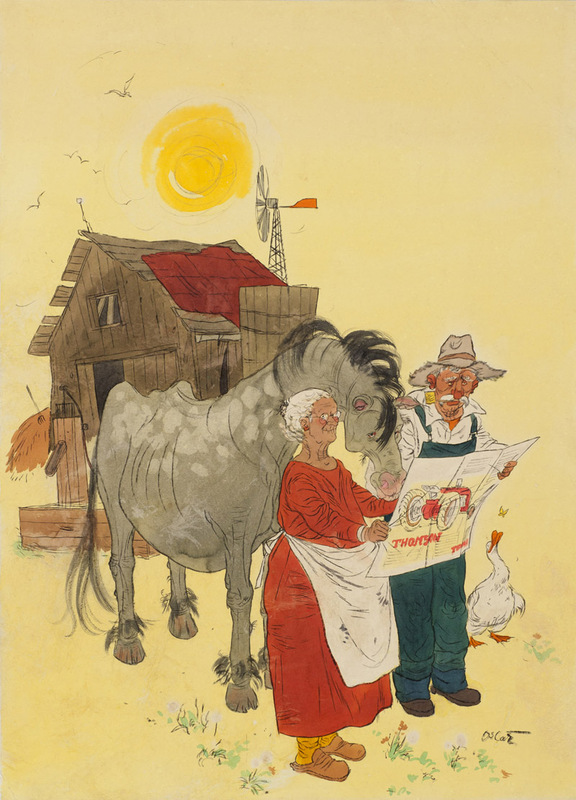 Oscar Cahén’s European background led to his receiving commissions for these “ethnic” stories. Genre scenes of everyday Canadian life were folksy, with characters made a little more cartoonish, cute, or hayseed than they might be in real life, perhaps based on locals Cahén befriended in rural Ontario, where he lived. 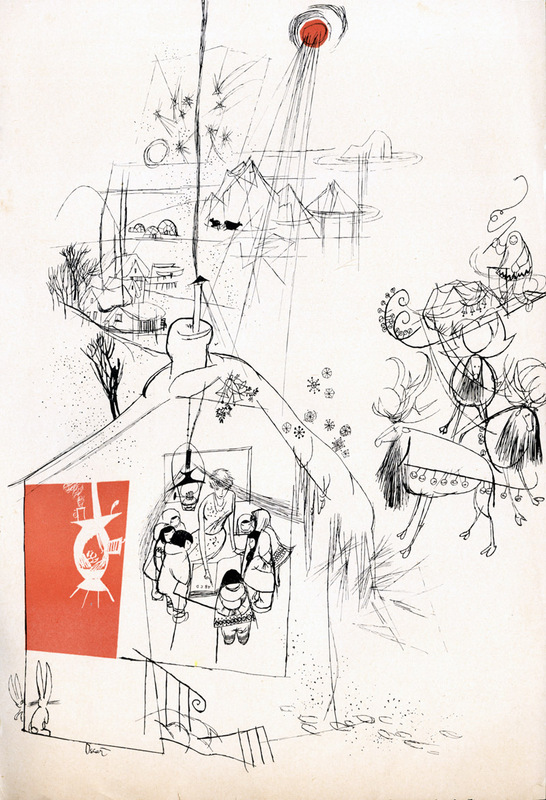 ”The House the Horse Built,” 1951. We don’t know where this image appeared. If you do, contact The Cahén Archives. Depending on the tone of the story, Cahén’s native and peasant characters could be somber and dignified or jocular and quaint, but never were they insensitive (Bolsheviks aside). Cahén enlivened genre scenes by inserting descriptive detail, sometimes quite personal. 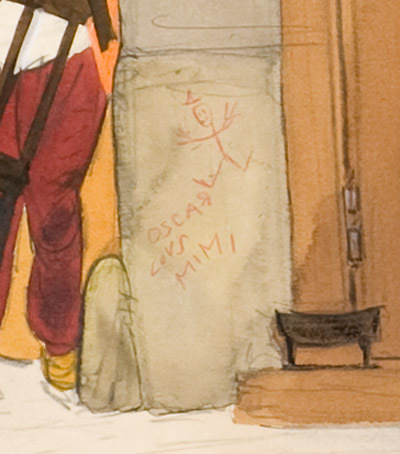 In this café scene, graffiti on the wall reads “Oscar loves Mimi” (his wife). 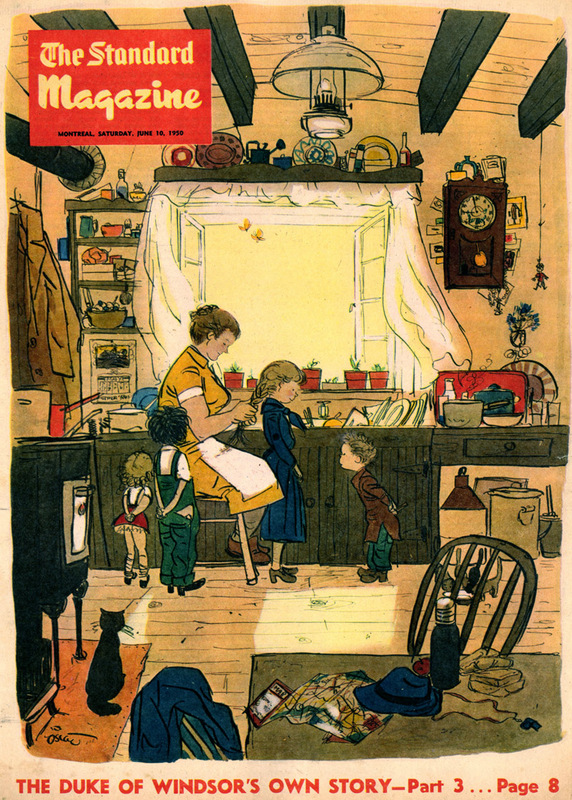 A Standard cover depicting a mother in a country kitchen braiding her daughter’s hair before sending her off to a Girl Guides excursion is filled with telling clutter—and some of Cahén’s favorite recurring motifs: dancing butterflies, a hanging doll, and a wood burning stove. ... notice the "How to Paint" manual, and the overly Disney-esque critters. 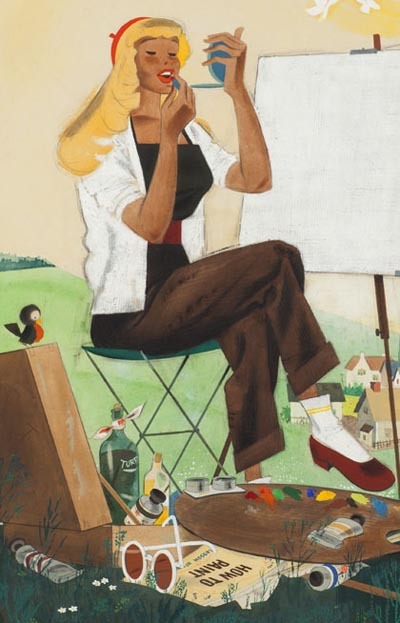 The "cute babe" is not looking at the landscape, and she is not painting it -- she's painting her face. Cahén's well-known contempt for formulaic painting and the Canadian plein-air landscape tradition comes through loud and clear. 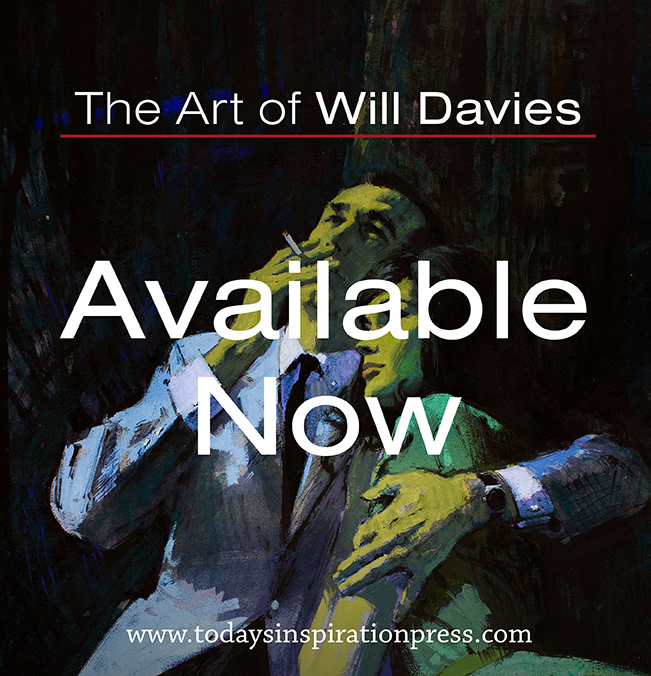 So telling...Illustrations and Text alike.